Some multi-week schedule views do not have a Publish button. Your main manager may not have set your permissions to allow you to publish. 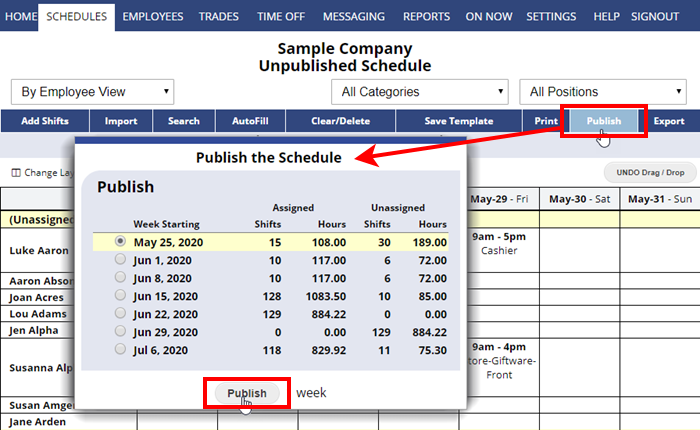 Once your schedule is finished and you want to make it viewable by your employees when they sign in, you can Publish it. Publishing affects shifts for ALL POSITIONS in the account. When you Publish a schedule, your employees will then be able to see that week when they sign into their individual employee accounts. Employees can also choose to receive their published schedules via email. Employees will see a “New Schedule” alert on their employee home page. Employee has clicked the email link to confirm receipt of their latest updated emailed schedule. If you would like to Publish more than one week at a time, you can navigate to the first week and then click Publish – this will display all future weeks with shifts and you can choose how many weeks to Publish at that time. Note: If you need to publish certain positions or position groups (locations) separately, you can set up separate WhenToWork accounts (assuming you do not have any employees that work at multiple locations). These accounts can be linked for billing purposes so that there is no extra cost. Since all positions must be ready before Publishing, we recommend only one or two managers have permission to Publish. Use the ANALYZE shifts function to check for any conflicts against the current employee work time preferences and constraints. Conflicts could occur if an employee has changed their work time preferences since you AutoFilled or created the schedule. Note: Publishing sends notifications to all employees if you have entered their email and that notification option has been chosen. Employees can click a link in the email to verify receipt of the schedule (You can turn off these notifications on your SETTINGS page). You also can send sign in instructions to your employees before publishing the first time that includes their username and password. After publishing, the title at the top of the screen will show “Published Schedule” and the buttons will change. Some functions, such as Import, AutoFill and Clear, are not available after a schedule is published. A WhenToWork email is sent to employees (who have set up their notifications) informing them that there is a new schedule. Employees can then sign in and see their schedule using their own username/password. Any employee with an email entered and has chosen that notification option, will also receive an email that includes their schedule, any schedule notes, and a list of any open shifts they can work. You can track which employees have viewed the schedule, been sent an email, or verified receipt of the email on the Statistics or By Employee Schedule View. You also will see the “On Tradeboard” icon and the “Trade Pending Approval” icon on this view next to any shift on the Tradeboard or awaiting approval. post a schedule, posting, make public, let employees see view schedule.